This is a sponsored post written by me on behalf of TruMoo Milk . All opinions are 100% mine. 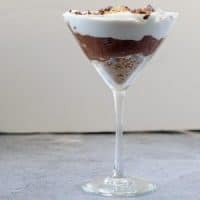 This homemade s’mores pudding cups recipe is perfect for a special treat for the kids or even a romantic date at home. I don’t know about you all, but when I think of favorite classic kid-friendly desserts, one of the first things that comes to mind is pudding, especially chocolate pudding. I was never a big fan of drinking milk, unless it was chocolate, of course. Even though I know it’s good for me, I’m honestly still not. But, I sure did (and do) love pudding. So, one way my mom would try to get me to have more calcium and all that good stuff was to make homemade pudding so I wouldn’t be constantly asking for chocolate milk. I so want to dig my spoon into these yummy layers of graham cracker, chocolate pudding and whipped cream again! I wish we had had TruMoo chocolate milk back then so my mom would have felt better about giving me chocolate milk. After all, finding the right balance between happy and healthy is never easy. But, TruMoo certainly helps to fill the gap. Even as an adult, I love indulging in TruMoo’s chocolate milk. Why? I know it has no artificial growth hormones, no high fructose corn syrup and is fresh from trusted dairies, unlike many other brands these days. 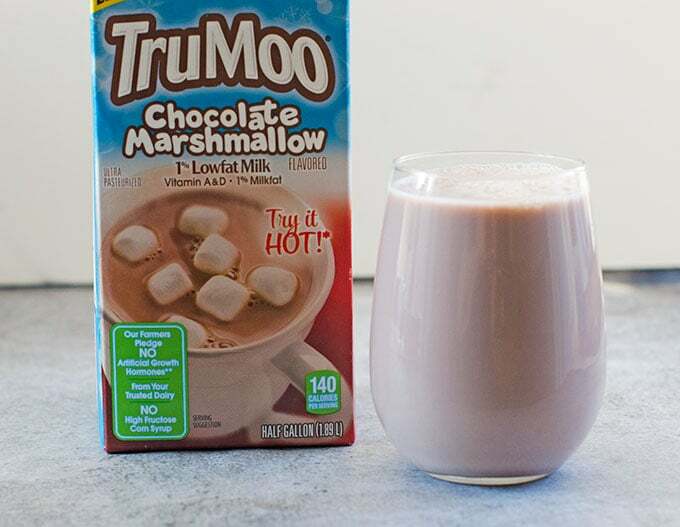 So, when TruMoo asked me to create a yummy Valentine’s Day recipe with their limited edition TruMoo Chocolate Marshmallow milk, I couldn’t say no. 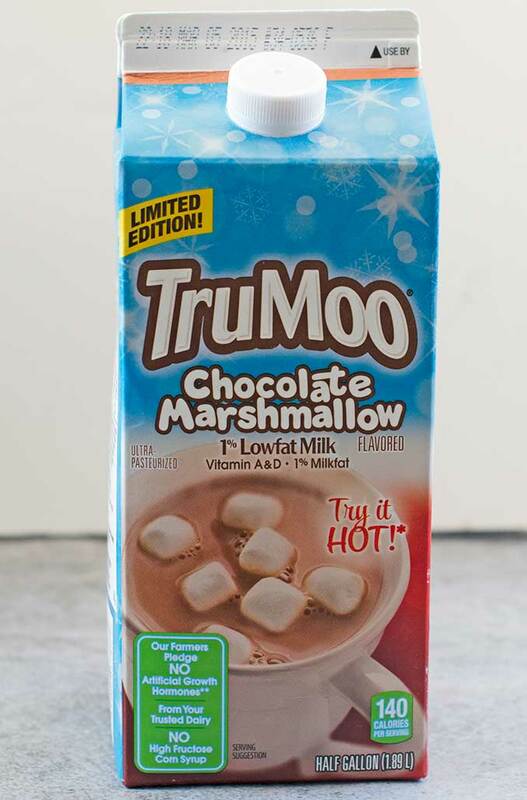 It totally amazes me that TruMoo’s Chocolate Marshmallow milk actually tastes like chocolate milk with marshmallows without having a lot of weird ingredients in it, but it does! I’ll even admit that I liked the flavor so much the first time I tried it that I had a second glass right after I finished the first. While it’s great cold, I like to also warm it up for a super quick and delicious hot chocolate. So, with my love of pudding and already having the base of chocolate and marshmallow flavor, I knew I had to come up with a homemade s’mores pudding cups recipe! The result is a smooth and rich homemade chocolate pudding layered between graham cracker crumbs and whipped cream. So. Good. It’ll be a great Valentine’s Day chocolate recipe to share with the kids or just your sweetie! This homemade s'mores pudding cup recipe will be loved by the entire family! In a medium saucepan or skillet, whisk together the sugar, cocoa, cornstarch, and salt. Take a moment to try to get as many lumps out of the ingredients as possible. Slowly drizzle the milk over the previous ingredients while whisking. Again, take the time to get as many of the lumps out as possible so your pudding is smooth. Heat pan over medium heat and bring the mixture to a boil, whisking the entire time. Once the mixture is boiling, let it boil for 1 minute while continuing to whisk the entire time. After 1 minute, remove the pan from the heat and whisk in the butter and vanilla. If your pudding is lumpy, you can strain it at this point. Otherwise, pour pudding into a bowl and top with plastic wrap. Be sure to press the plastic wrap down directly onto the surface of the pudding so a skin doesn't form. Chill pudding until cold, about 2 hours. Assemble the s'more pudding cups by putting about 1/8 cup of graham cracker crumbs into each bottom of 4 glasses or bowls. Top crumbs with about 1/2 cup of pudding in each cup. Top pudding with about 1/4 - 1/2 cup whipped cream. Garnish with chocolate, additional crumbs and/or marshmallows if desired. Serve immediately, refrigerating any leftovers. This would also be great with pretzel crumbs instead of graham crackers if you like sweet and salty! 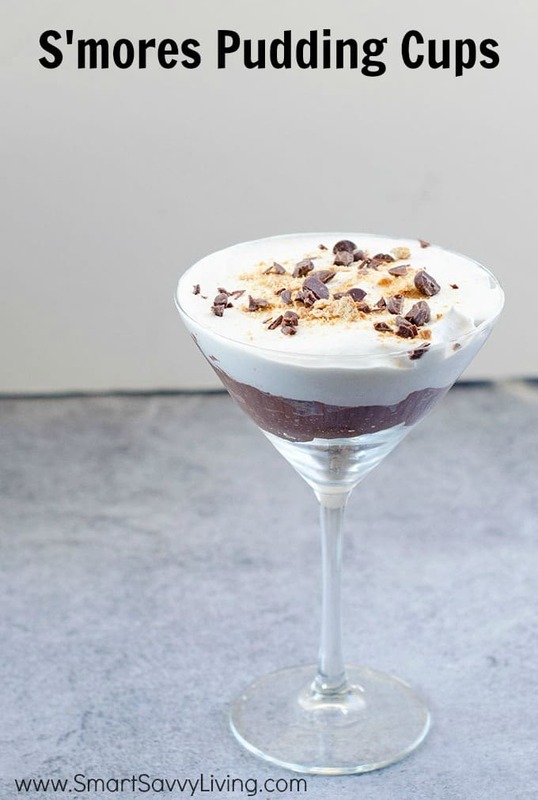 This s’mores pudding recipe makes 4 good-sized desserts so you can have a special treat for the kids on Valentine’s Day. Just remember to hide one in the fridge to share with your sweetie! For product information and availability, visit TruMoo online. You can also Find TruMoo Recipe inspiration on Pinterest and Join the TruMoo community on Facebook. How fun to put it in a martini glass like that! So fun to fancy it up and show the layers. I’ve seen a few different recipes this week using Trumoo and I want to try them out! I am KIND OF addicted to s’mores! I will definitely be making these babies tomorrow!! Those look yummy! S’mores seem to be the in thing right now as I just shared a S’mores recipe twist too made with popcorn.